Tech temp tattoos are nearly here. Microsoft Research and MIT's Media Lab have published details of Tattio, a futuristic research project looking into "on skin" technology. Inspired by the kind of metallic temporary tattoos you'd find at Coachella or Glastonbury, the team used gold imitation leaf metal and applied it to tattoo paper with stencil traces. In terms of functions, Microsoft Research and the Media Lab then experimented with a few ideas. The first was NFC tags to act as your digital identity and the idea is that people could choose how big an antenna they want to use in terms of both aesthetics and power. Next, thanks to conductive fabric tape and basic curvy, customisable wires, the team added LEDs and vibration motors to experiment with other features that a tech tattoo could offer. The last, more fashion focused idea was to create heat-activated colour changing tats by applying a layer of thermochromioc paint. The cost of a Tattio NFC tag is reportedly only about $1.50, making it as affordable as dumb temporary stick-on tattoos. It's removable, obviously, and is designed to be robust enough to last a full day so could make sense for events. The prototype that was worn by testers (who felt "cyborged") worked with a smartphone app that could display an image and text when close to each tech tattoo. 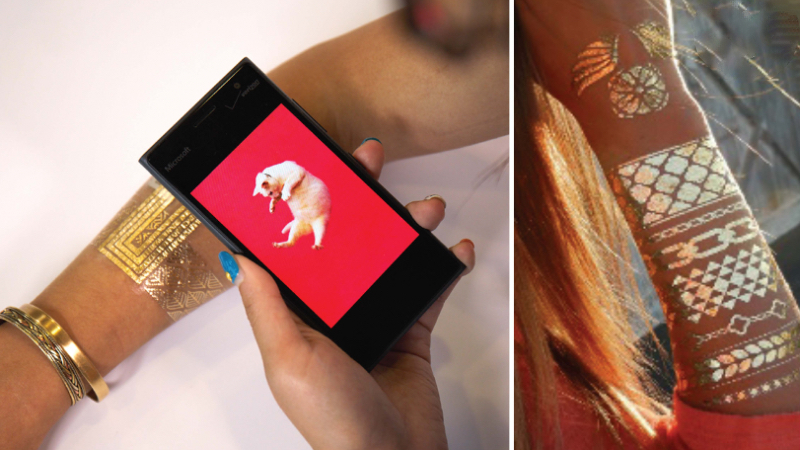 This isn't the first time we've seen connected, temporary tats - Austin studio Chaotic Moon had a neat concept last year - but Microsoft Research seems to well on its way to making an affordable, useful and fashionable stick-on. When will we be able to buy one? Who knows.